If you need a convenient and reliable way to supply multiple pneumatic lines or implements from a single source, you need Pneumadyne’s polypropylene 6-station manifolds. Ideal for applications with an operating pressure of 0-150 psi, these pneumatic manifolds are suitable for use with air or water. 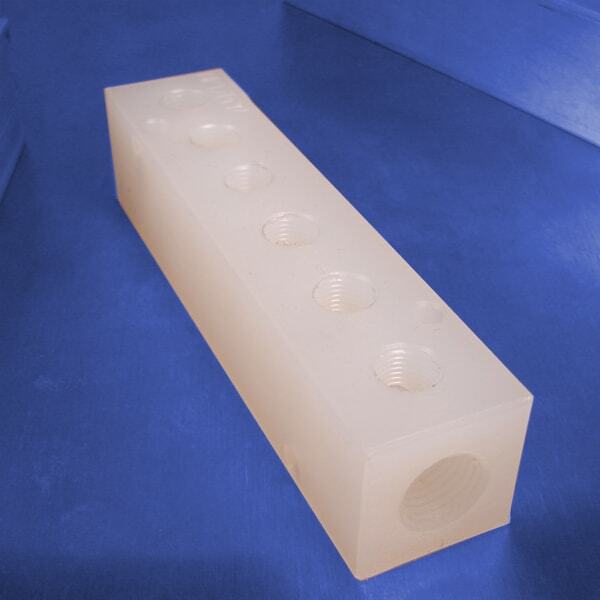 These manifolds are precision machined from durable natural (white) polypropylene, and are available in two standard input sizes: 1/4 NPT (F) and 3/8 NPT (F). Threaded ports provide fast and easy connections for fittings of all types. Two sets of mounting holes provide multiple installation options. Order the 6-station polypropylene pneumatic manifolds you need, contact Pneumadyne to learn more.